У статті розглянуто специфіку художньо-естетичних засобів відображення антропологічних параметрів національного універсуму у поетичному дискурсі англійського поета-романтика Джона Кітса. Проаналізовано особливості поетичної концептуалізації основних націєідентифікаційних концептів БАТЬКІВЩИНА, МОВА. ПОЕТ та ПОЕЗІЯ. Keywords: John Keats, English literature, Romanticism, poetics, literary concept. Background: The poetic heritage of John Keats has become the object of heated discussions both in foreign and domestic literary criticism. Scholars make attempts to explain and interpret it proceeding from different ideological positions claiming the diversity of philosophic and aesthetic richness of his poetry resulted from duality of poet’s literary intentions to achieve a certain independence of “eternal” art from a surface, temporary manifestations of life and at the same time to expose by the power of poetic image all manifestations of human life. Keats’s poetry is not devoid of comprehension of social and political issues related to the problems of national identity and implementation in the poetic context morally oriented points. 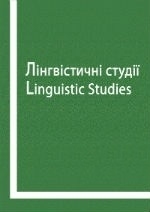 Thus, the topicality of the theme in the focus of this research lies in the general orientation of modern discourse studies towards comprehensive analysis of different aspects of poetic semantics and pragmatics based on interpretations of literary texts belonging to different epochs of national literature development. The aim of this paper is to reveal the peculiarities of interpretation, creation, implementation and retranslation of fundamental categories of national identity as a phenomenon of human existence in the context of national environment within John Keats’s literary artistic system. The aim is achieved by analyzing the dynamics of poetic, semantic, pragmatic, aesthetic, conceptual and artistic textual resources interrelation as a unity of form and content. Results: Poetic actualization of nationally specific concepts in Keats’s poetry is anthropocentric in its nature. Keats poetic conceptualization discloses itself as a reflection of creative and cognitive activity of a poetic personality, directed towards representation of the national environment in the system of multilevel senses that fix poly cultural experience of the nation aggregated in the literary universe of different epochs and ethnos. The anthropocentric nature of national space poetic representation consists in the interrelations of the elements belonging to three basic semantic domens: “the poet” as the preserver of invaluable ethnically specific and universal knowledge; “myth” – mythologeme, association, allusion representing the dialectics of the cultural evolution of the nation, the most typical impressions and stereotypes in the structure and forms of literary consciousness; “nature” – inspired physical substance of the being existing in its primary forms of human and social adaptation to geographic environment, forms of cultural and artistic experiences. Discussion: The problem of Keats’s literary aesthetic system needs further analysis due to its complexity and relations to both romantic and modern artistic cognition approached from analytical positions of cognitive poetics. Nataliia Romanyshyn is the Associate Professor of the Department of applied Linguistics of Lviv National Polytechnic University. Arias of interest include stylistics, poetics, cognitive poetics, narratology, pragmatics, discourse studies. Ключові слова: Джон Кітс, романтизм, англійська література, поетика, художній концепт. The statement about close proximity of poetry and philosophy (Gadamer, “Aktualnost prekrasnogo” 116), about the specific value of a poetic word [ibid. 118], its ability to attract senses, to hint at a many-voiced interpretations has become axiomatic and has been proved by poetic practice, researches within the domain of aesthetics and literary art. The complexity and multilateral structure of poetic text semantics, a unique character of its elements and their unity determine the synchronization of poetry with different historic epochs, its constant renovations with the course of time (Gadamer, “Philosophia i literatura” 132). Thus, the text presupposes different ways of interpretation and calls for various ways of interpretations that cannot be exhausted by a single comprehension, but on the contrary, enrich the sense of a poetic work and simultaneously enrich the interpreter himself. This uniqueness and unfathomable depth pertain to the poetic heritage of John Keats, the youngest among the cohort of English romantics, whose short life and work closed too abruptly. And although the officially recognized completion of romantic epoch occurred much later, and the poets of the romantic school continued their activity, traditionally the personality of John Keats is considered as such that with his poetic achievements marked off the final chord of romantic polyphony in the English literature. But at the same time he made the opening of a new poetic system, since the modernization of poetic art, its aesthetic advancement and development of conceptual and lingual dominants were conceived within the artistic resources of Romanticism (Bieliy 226; Tolmachov; Urnov; Hartop) with its priorities of humanistic values, consistency of general European literary traditions that extended the boundaries of local national system of worldview (Pavlychko 204). According to W. Ulmer, Keats started his poetic career in the time when British literature intensively nourished new cultural traditions and stereotypes, laid the foundations of national cultural legacy and entered the period of controversy in literary receptions and assessments which was a delayed effect of a great scale modernization of British society and culture (Ulmer). Literary-aesthetic principles of Keats’s worldview were created in the context of Coleridge’s ideas about the cognitive potential of art and poetic imagination able to create the world, about the unity of form and content as necessary conditions of artistic merit, about the world as a reflection of its creator; in the context of Wordsworth’s empirical sensual conceptions about the exceptional value of associative abilities of cognition and their role in the creative processes, his aspiration towards the renovations of formal and meaningful aspects of the poetic art; in the context of controversial positions of both poets concerning the objective, social basis of poetic imagery, either its gravitation or repulsion of tragic conflicts of reality. These principles were developed in the context of notions of historic character and universal nature of art as an expression of poet’s involvement in the world processes, understanding of contemporary problems, their imagery refining, aspirations to subject the poetry to moral and political education of nation and humanity in the whole, advocated by Byron and Shelly (Diakonova, “Keats i yego sovremenniki”). The dramatic character and specificity of Keats’s poetry lies in its interconnection with all trends of English Romanticism, which caused controversies in its adaptation and interpretation in world and domestic criticism (Roe; Ulmer; Diakonova, “Keats i yego sovremenniki”; Diakonova, “Angliyskiy romantism”; Yelistratova; Fermanis; Rzepka; Levinson; Haverkamp). In the ambition to formulate his own existential and artistic values Keats in his poetry attempted to achieve a certain independence of “eternal” art from a surface, temporary manifestations of life, nurturing the cult of perfect poetic forms, harmony of sensually saturated images, embodiment of absolute artistic “beauty-and-truth” conception – with the attention to the sources of European civilization, the context of Antiquity and European Renaissance as well as the national cultural background. Adaptation of this poetic mission made Keats a creator of a unique poetic world, determined by its own principles, linking in one context the past and the present, interlocking different chronotopes and realia, applying the principle of intertexuality that impregnate textual representatives of different cultural codes with universal symbols and semantic diversity, implement in the text such morally oriented points that foster its endless life and topicality. This artistic synthesis enabled, transferring poetic experience outside the boundaries of national context, to provoke a new sense creation of extraordinary emotional, spiritual and social power, elaborate his own poetic principles that outpaced the canons of the time (Vitkovskiy). Despite the great number and diversity of researches, dedicated to the development of Keats’s poetic and aesthetic system, artistic qualities of his imagery resources, sources of creative inspiration and relation of his poetic themes to philosophic ideas, peculiarities of adaptation and interpretation of mythology in his poetic works (Sandy; White; The Challenge of Keats; Victorial Keats; Nagar, Prasad; Cambridge Companion) the question of poetic conceptualization of national identity in Keats’s discourse has not been addressed in literary criticism and poetics. The purpose of the paper is to reveal the peculiarities of interpretation, creation, implementation and retranslation of fundamental categories of national identity as a phenomenon of human existence in the context of national environment within John Keats’s literary artistic system. The purpose is achieved by analyzing the dynamics of poetic, semantic, pragmatic, aesthetic, conceptual and artistic textual resources interrelation as a unity of form and content. The research is carried out within the framework of linguo-poetics with application and integration of linguo-cognitive, cognitive-semiological and cognitive-poetological principles. The object of the research is national identity as linguo-poetic phenomenon which is a product of artistic cognition and comprehension of fundamental existential categories reflecting individual and collective perception of national environment. The research subject is the specificity of poetic conceptualization and verbal-imagery representation of national identity in Keats’s poetry. The notion of poetic conceptualization of national identity covers the correlation of anthropocentric and spacial literary concepts that arose in the result of cognitive, creative and aesthetic activity of the poet as a representative of a certain epoch and nation. The main task of this research is to reveal the dominating tendencies of Keats’s poetic discourse in representation of national identity by reconstruction of interrelation between imagery-symbolic, narrative, conceptual and verbal planes of the poetic text. The applied methodology is based on the cognitive-semiological and hermeneutic approaches to the interpretation of literary text semantics as multidimantional synthesized unity. They determine complex systemic analysis that integrates the acheivements of linguo-poetics, cognitive poetics, linguo-cultural and literary studies and the development of analytical vector: from definition of genre and stylistic parameters of the analysed texts, the general ideological and aesthetic peculiarities of author’s mentality and artistic principles, delimitation of author’s individual conceptual system, specification of literary concepts of national identity; to the explication and description of their verbal-imagery representation. To achieve this task the following methods are applied – conceptual analysis, contextual analysis, narrative analysis, lexico-semantic and stylistic analysis. The researchers of Keats’s poetry claim that irrespective of some scarce explicit expressions of political ideas concerning civil, patriotic, social issues the author tended to oppose the blunt didactic and morally imperative function of poetry (Diakonova, “Keats i yego sovremenniki” 63). Nevertheless, Keats firmly believed that the poet for the sake of the art should be able to absorb all manifestation of the reality no matter how greave and unattractive they could be, deepening in this way the understanding of artistic devotion to the truth – from the sense to emotion, from emotion to passion that encompasses his whole moral and intellectual being (Hartman). Nationally and socially specific concepts do not constitute the complete artistic system in Keats poetry. Several chrestomathy samples from the poem Isabella and the introduction to the third book of Endymion (often in the context of quotation from poet’s letters to his friends and close associates) are traditionally interpreted as his expressions of hatred to any forms of violence, exploitation, the struggle against oppression on the ground of state and status, riot against the existing system of social benefits and advantages, against the society built on the principles of commerce (Yelistratova; Bromwich). To watch the abysm-birth of elements (Endymion: Book IІІ). The determining feature of Keats’s text creation lies in the transference of socially and ideologically meaningful information into the subtext, symbolic level, where contextually sensitive lingual and aesthetic elements irradiating slightly perceptible and varying axiological impulses hide deeply personal, civil and ethical experiences – the fundamental questions of life, good and evil, the problem of individual and collective identity. For example, the mist covering the mounting tops to the line of horizon, steep bulky stones are the imagery elements that reflect the real landscape and symbolize physical and mental obstacles on the way to penetration to the sense of the human existence. Into oblivion → fresh flowers will grow,/ ↔ And many glories of immortal stamp. In the poem To Hope the state of the lyrical subject (by my solitary hearth I sit, hateful thoughts enwrap my soul in gloom, no fair dreams before my "mind's eye" flit, my morbidfancy, Disappointment, parent of Despair … seize my careless heart; Tells to my fearful breast a tale of sorrow), who deeply empathizes with the fate of his motherland and his compatriots (the fate of those I hold most dear) are outlined by dark colours, the lack of hope is represented by a symbolic actions “shading, inability of the light to penetrate through thick boughs”, spiritual discomfort is compared with thorny leaveless shrub. Whereas the sense-line “hope →a timid feeling for a way to human harts→ a search for one’s predestination (O let me think it is not quite in vain/To sigh out sonnets to the midnight air) is treated in the plane of contextual associates interaction “silver”, “bright light”, “celestial body”, “fragrance”, “balm”. However, there is much of deep sense in David Bromwich’s statement that despite the aspirations of the young poet to become a “real political poet” his main asset to the English literature lies in the discovering of all penetrating soul, his poetry failed to be considered solely from positions of political or apolitical bias in terms of its evasion from or penetration to social issues (Bromwich). Keats’s aesthetic intention to grasp the truth of beauty becomes the leading factor of poetic intimization and humanization of national universe and the concepts of national identity – motherland, nation, country, historic and cultural continuity. And float with them about the summer waters (Happy Is England! I Could Be Content). Keats’s social milieu and background determined the possibility to study his poetry inside the so called Cockney School (Roe 65-88). Modern Anglophone criticism treats the content of Cockney phenomenon discussion as a politization and sociologization of certain trends in English Romanticism, although most scholars intensify its importance for a further development of national literature and literary language (see Wu; Barnard; Mugglestone). Poetization of these special “low” everyday themes (A Song About Myself, On Hearing The Bag-Pipe And Seeing, Where Be Ye Going, You Devon Maid? ), poetic stylization in the spirit of London vernacular, following in the form and content the folk poetics (A Galloway Song): either humoristic or spicy (Dawlish Fair, Give Me Women, Wine, And Snuff) characteristic for Keats’s poetry correspond to Wordsworth’s determination to include into the poetic expression topics and “language” of different social strata. Me how to harbour such a happy thought) and a bright palette of images that represent the phenomena of sensual sphere (whispers of the household gods that keep /A gentle empire o'er fraternal souls; This morn, my friend, and yester-evening taught/Me how to harbour such a happy thought; Sweet voice, sweet lips, soft hand, and softer breast,/Warm breath, light whisper, tender semitone,/Bright eyes, accomplished shape, and lang'rous waist! ; So could we live long life in little space,/So time itself would be annihilate; this world’s true joys); lexical units that make a suggestive influence on the addressee (busy flames play through the fresh laid coals; Your eyes are fixed, as in poetic sleep,/ Upon the lore so voluble and deep; When the dusk holiday -- or holinight/ Of fragrant-curtained love begins to weave/The woof of darkness thick, for hid delight); means of microcontext dialogization (But O, on the heather to lie together,/With both our hearts a-beating!/I'll put your basket all safe in a nook,/Your shawl I'll hang up on this willow,/And we will sigh in the daisy's eye,/And kiss on a grass-green pillow). Human oriented aspect of concept MOTHERLAND actualization and dialogization of poetic reflections in Keats’s poetry are inseparable from each other. Among the most frequent ways of dialogization of poetic word in Keats’s poetic discourse there is a genre of poems-dedications and poetic addresses to friends, poets-compatriots or to outstanding men-of-letters of the past. The poet applies this poetic format as a “platform” on which he expresses his own viewpoints concerning different urgent issues, among which there dominate the problems of aesthetics, nature of poetic creativity, essence of poetry, development of national poetic language and tradition, integrating in this way different epochs of national and general European culture into a complex unity ( poems If By Dull Rhymes Our English Must Be Chain'd, To George Felton Mathew, To Charles Cowden Clarke, What The Thrush Said. Lines From A Letter To John Hamilton Reynolds, Epistle To John Hamilton Reynolds, How Many Bards Gild The Lapses Of Time!Sonnet Xiii. Addressed To Haydon Sonnet Xiv. Addressed To The Same (Haydon) and closely related to them in terms of defined problems topicality (Sonnet To Spenser, Sonnet. Written Before Re-Read King Lear, Bards Of Passion And Of Mirth,How Many Bards Gild The Lapses Of Time!, Ode To A Nightingale, Sonnet: As From The Darkening Gloom A Silver Dove, Sonnet To Chatterton, Sonnet To Byron, On Visiting The Tomb Of Burns, Written In The Cottage Where Burns Was Born Lines Written In The Highlands After A Visit To Burns's Country). All mentioned poems in their aggregate reveal the integration of nationally significant concepts into a conceptual complex “human – poet” actualized within the following literary-semantic planes: “poets – compatriots, brothers and poets – great teachers” as a substantiation of continuity and succession of national poetic tradition, creative reception of other cultures and languages achievements, development of ideas concerning the elaboration of national poetic canon; “the poet and his predestination”, the nature of poetic enlightment, the sources of poetic inspiration; “national poetic language”, the perfection of national language, refinement of feeling and senses, the search for the ideal object of poetic description which would testify the independence of the eternal art from transient manifestation of life, promotion of the cult of perfect and accomplished poetic forms. These issues fostered the comprehension of ontological status of the poet and his power to create a specific world by the force of a word, the world where the order constructed from the chaos and mosaic of everyday manifestations advances toward the harmony between spiritual and physical, mental and emotional, pure poetry and civil serving, which substantiated the idea of spiritual unity of the humankind and succession of cultural traditions. The images of personalities of national and European cultural space are introduced into the micro- and macrocontexts imbued with literary concepts “poetry” ‘culture”, “literature”. They are usually implicitly verbalized within the image models “space” and “container” (In Spenser's halls he strayed, and bowers fair, Culling enchanted flowers); «політ» (and he flew With daring Milton through the fields of air: To regions of his own his genius true Took happy flights), “heart”, “pulse” (spirits there are standing apart Upon the forehead of the age to come; These, these will give the world another heart, And other pulses), “fire”, “celestial object”, etc. Thrown by the pitiless world); expresses the idea of timelessness, spacelessness, eternity of existence of “poetic soul”, simultaneousness of abidance in different locations and planes – the spheres of real and irreal – applying a traditional artistic device of dreaming, raving, wandering; introduces into the poetic plot toposes which provisionally could be defined as “existence of an object between the earth and the heaven” which is a repository of the whole cultural heritage, a location where present, past and future meet, the abode of poetic personalities of different times and nations: Great spirits now on earth are sojourning ( poems Epistle To John Hamilton Reynolds, Bards Of Passion And Of Mirth, Lines On The Mermaid Tavern). The absence of visible boundaries between the mundane and the elevated, the earth and the heaven, constant whirlpool of feelings and senses, transference of natural states, changeability of the focus from which the environment is comprehended, lack of definite special localization, modeling of poetic topos based on the idea of unity between nature and culture, spiritual syncretism – are the main features of poetization of the subject and the space in Keats’s poetic world. A woodland rivulet -- a Poet's death. Symbolism and associations of each textual element is multifaceted, inexhaustible, presupposes polyphonic interpretations (as, for example, the tender cheek of Sappho and the smile of a child allocated on a single parallel) and intends a constant “release of the sense” (Bart). The poet is a mediator between the worlds, multiple cultural spaces which he synthesizes and exposes. In this exposure he dissolves and exhausts himself (like sand in a sand clock), dies and is born again, constructing the text from different types of the script originating from different cultures, from the legacy of different verbal-literary elements that belong to different historic and cultural traditions and enter with each other into versatile semantic correlations. Semantic quintessence of the lyrical plot development centered on a famous name is based on the spiritual unity of the creative personality and nation, ethnic and local culture which gave him his birth. Herewith, this unity is of a two-way character – from the environment to the person and from the person to the environment as the emanation of spiritual impulses of the poet-demiurge into the current and future cultural atmosphere, spiritual leadership, avant-garde. The above mentioned statements can be exemplified by the corpus of the following poems To Charles Cowden Clarke, To George Felton Mathew, What The Thrush Said. Lines From A Letter To John Hamilton Reynolds, Epistle To John Hamilton Reynolds, Sonnet Xiii. Addressed To Haydon Sonnet Xiv. Addressed To The Same (Haydon), Sonnet Xi. On First Looking Into Chapman's Homer, Two Sonnets. To Haydon, With A Sonnet Written On Seeing The Elgin Marbles, Sonnet To Chatterton, On Visiting The Tomb Of Burns,Written In The Cottage Where Burns Was Born,Lines Written In The Highlands After A Visit To Burns's Country. Beneath the curved moon's triumphal arch; names of national flora and fauna, objects of the national landscape – Some flowery spot, sequester'd, wild, romantic, Where oaks, that erst the Druid knew, are growing, dark-leav'd laburnum's drooping clusters , intertwined the cassia's arms unite, covert branches, the nightingales, leafy quiet, the pillars of the sylvan roof, violet beds, the bee with cowslip bells was wrestling, a ruin dark, and gloomy; numerous precedent names characterized by specific attributive markers that reflect clearly defined imagery-associative and connotative information rooted in the recipients’ consciousness in the result of the historic processes– Chatterton, warm-hearted Shakspeare, moralize on Milton's blindness, those who in the cause of freedom fell, our own Alfred, Helvetian Tell, whose name to ev'ry heart's a solace, High-minded and unbending William Wallace, Burns. To meet her glorious brother’s greeting beam. The above mentioned and similar imagery models and motives of interpenetration of poetic image and poetic “ego” (O fret not after knowledge -- I have none, /And yet my song comes native with the warmth. O fret not after knowledge -- I have none, /And yet the Evening listens; O that our dreamings all, of sleep or wake, /Would all their colours from the sunset take: / From something of material sublime, /Rather than shadow our own soul's day-time /In the dark void of night. For in the world /We jostle) refrain in a set of Keats’s poems which enables to speak of the dominance of poetic conceptualization of motherland as personalized, intimate, creative and intellectual space, the space of spiritual mentors (How many bards gild the lapses of time!/A few of them have ever been the food / Of my delighted fancy,—I could brood/Over their beauties, earthly, or sublime:/And often, when I sit me down to rhyme,/These will in throngs before my mind intrude:/But no confusion, no disturbance rude/Do they occasion; 'tis a pleasing chime). Similar to a poetic image that is the imprint of reality, the reality itself bears an imprint of the poetic image, created by a talented word of the poet, is his replica, his shade, his soul: a Bard's low cradle-place; at the cable's length/ Man feels the gentle anchor pull and gladdens in its strength. Anthropocentric aspect of concept MOTHERLAND poetic actualization in Keats’s poetic discourse encompasses a set of meanings that are the means of literary reflection of individual and collective identification – the concept NATION (Listen awhile ye nations; the people; people of no name,/In noisome alley, and in pathless wood; native skies) as well as the wide range of related problems, such as spiritual unity, specificity of national reception of poetry and cultural legacy created inside and outside the national environment, poetic embodiment of the relations “poet and nation”, social and political topics, etc. (Sonnet Xiii. Addressed To Haydon, Sonnet Xiv. Addressed To The Same (Haydon). Keats poetics represents an essential change in the character of interrelation between a human and national space, it takes shape of the cyclic, contentious spiritual motion in the circle created by unity of elements “nature – poet-mythologist – poetry”. The world of Keats poetic conceptualization discloses itself as a reflection of creative and cognitive activity of a poetic personality, directed towards representation of the national environment in the system of multilevel senses that fix polycultural experience of the nation aggregated in the literary universe of different epochs and ethnos. The surrounding world is a temple of poetry and nature, paradise on the earth, the place of pure rapture (pleasure's temple= a poet's house). The architecture of this temple consists of the unity of the elements belonging to three basic semantic domens: “the poet” – name, personality-mediator – the preserver of invaluable ethnically specific and universal knowledge; “myth” – mythologeme, association, allusion – the dialectics of the cultural evolution of the nation, the most typical impressions and stereotypes in the structure and forms of literary consciousness among which there dominate the criteria of beauty, harmony, perfection, eternity; “nature” – inspired physical substance of the being existing in its primary forms of human and social adaptation to geographic environment, forms of cultural and artistic experiences – fragments of the picture of the world and their unity, comprehension of the basic vital categories. The poet is placed in the center of existential, cognitive and communicative spheres “human – nature” and “human – human” that determine intersubjectivity, anthropocentricity, dialogization of cognitive structures poetic exteriorization. In the structure of the notional layer of the concept MOTHERLAND these aspects serve as knots creating the intersections of semantic lines that represent social and natural determinants of ideological and thematic feature of Keats’s poetics. Conclusions. The conceptual core of national identity representation in Keats’s artistic system is created by interrelation of dominating conceptual models: 1) “Motherland in its anthropocentric dimensions”. In its discursive realization it is constructed through humanization of national social environment by extensive introduction of precedential names; its representation as a universe of “great teaches”, dialogization of poetic context as a contamination of different temporal and cultural perspectives, enhancement of pragmatic value of aesthetic resources by intertextuality that develops semantic polyphony of poetic context, enriches the expressive potential of verbal imagery, fosters its modernization; 2) “Motherland as an absolute value, the source of artistic inspiration”. In its discursive realization it is constructed through contamination of mundane and sacred themes, material and spiritual manifestations, unity of historical, mythological and literary subjects. The spectrum of evaluative meanings in poetic conceptualization of national environment encompasses aesthetic, ethical, hedonistic, emotional values expressed by notions that are solely positively comprehended: beauty, truth, closeness, intimacy, continuation of national artistic tradition, emotional comfort, perfection, harmony, sensitivity. Positive axiology of the represented literary concepts determines the modes of their textual embodiment among which there are the most typical ones – “motherland – paradise on the earth”, “motherland – animated creature/woman”, “motherland – beauty”, “motherland – myth and reality”. Artistic reflection of interrelation between a human and national environment in Keats’s poetry manifests the dynamics of individual artistic priorities development from embodied in poetic forms the basic social values, moral ideals to the comprehensive representation of national existence and its deployment through the categories of ethics, intellectualism, synchronization of different cultural layers of national and European experience from different historical and worldview systems in a single poetic dialogue. These artistic intentions led to the essential changes in conceptual system of poetic discourse and in resources of lingual-expressive means which extrapolated versatile imagery and symbolic forms of national folklore and mythology, samples of antique poetic practice into a renewed context of Romantic literature. Intensive implementation of elements nurtured by different cultural and intellectual sources into the poetic context performed alongside with aesthetic function informative and axiological ones and advanced the modernization of national poetic picture of the world, as well as reflected specific shifts in national self-representation and in the system of national cultural universals. Barnard, John. "Charles Cowden Clarke's 'Cockney' Commonplace Book." Keats and History. Edited by Nicholas Roe. Cambridge: Cambridge University Press. 1995. 65-87. Print. Bart R. “Smert' avtora (The death of the author)” Izbrannye raboty (Selected works). Moscow. 1994: 384-391. Print. Bieliy A. Kritika: Estetika: Teoriya simolisma (Criticism: Aesthetics: Theory of symbolism). Moscow: Respublika. 1994. Vol.2. Print. Bromwich David. “Keats's Radicalism” Studies in Romanticism. Vol. 25, No. 2 (Summer, 1986): 197-210. Published by: Boston University. : http://www.jstor.org/stable/25600592. Web. 12 June, 2014. The Cambridge Companion to Keats. Ed. By Susan J. Wolfson. Cambridge: Cambridge university Press. 2001. Print. The Challenge of Keats. Bicentenary Essays, 1795-1995. Ed. by. Allan C. Christensen. Amsterdam – Atlanta: Rodopi GA, 2000. Print. Diakonova N. Angliyskiy romantism: Problemy estetiki (English Romanticism: Problems of aesthetics). Moscow: Nauka, 1978. Print. Diakonova N. Keats i yego sovremenniki (Keats and his contemporaries). Moscow: Nauka. 1973. Print. Fermanis, Porscha. John Keats and the Ideas of the Enlightenment. Edinburgh University Press. 2009. Print. Gadamer G.-G. Aktualnost prekrasnogo (Actuality of the beautiful). Moskow: Iskusstvo. 1994. Gadamer G.-G. Philosophia i literatura (Philosophy and literature). Moskow: Iskusstvo. 1991. Print. Hartman, Geoffrey. “Romanticism and Anti-Self Consciousness” Beyond Formalism: Literary Essays, 1958-1970. New Haven (Ct.), L.: Yale UP. 1970. Print. Hartop, Christopher. The Classical Ideal: English Silver, 1760–1840. Cambridge: John Adamson. 2010. Print. Haverkamp, A. “Mourning Becomes Melancholia - A Muse Deconstructed: Keats's Ode on Melancholy” II New Literary History. Charlottesville. (1990). Vol.21. №3: 693-706. Print. Levinson, Marjorie. Keats's Life of Allegory: The Origins of a Style. Oxford: Basil Blackwell. 1988. Print. Mugglestone, Lynda. "The Fallacy of the Cockney Rhyme: From Keats and Earlier to Auden." The Review of English Studies 42, No. 165 (February 1991): 57-66. Print. Nagar A., Prasad A.N. Recritiquing John Keats. New Delhi: Sarup &Sons, 2005. Print. Pavlychko S. Teoretychniy dyskurs ukrainskogo modernism (Theoretical discourse of Ukrainian modernism). Diss. Kyiv. 1995. Print. Roe N. Keats and the Culture of Dissent. Oxford: Clarendon Press. 1997. Print. Rzepka, Charles J. The Self As Mind: Vision and Identity in Wordsworth, Coleridge and Keats. Cambridge (Mass. ), L.: Harvard UP. 1986. Print. Sandy, Mark. Poetics of Self and Form in Keats and Shelley: Nietzschean Subjectivity and Genre. Ashgate, 2005. Print. Tolmachov V. “Neoromantism” (Neoromanticism)”. Literaturnaya encyclopedia terminov i poniatiy (Literary encyclopedia of terms and notions). Ed. By A. Nikoliukin. Moscow: Intelvak. 2001. Print. Ulmer, William A. John Keats. Reimagining History. Palgrave Macmillan. 2017. Print. Urnov M. Na rubiezhe veikov (On the turn of the centuries). Moscow: Nauka. 1970. Print. Victorian Keats and Romantic Carlyle: The Fusions and Confusions of Literary. Ed. by C. C. Barfoot. Amsterdam – Atlanta: Rodopi GA, 1999. Print. Vitkovskiy E. “Voshod Endimiona (The rise of Endymion)” John Keats. Stihotvoreniya (Poems). Moscow: Ripol classic. 1998. Print. White, Keith D. John Keats and the Loss of Romantic Innocence. Amsterdam – Atlanta: Rodopi GA,1996. Print. Wu, D. “Keats and the “Cockney School”. The Cambridge Companion to Keats S. Wolfson (Ed.). Cambridge: Cambridge University Press. 37-55. Print. Yelistratova A. A. Naslediye angliyskogo romantisma (The Legacy Of English Romanticism). Moscow: Akademia nauk SSSR. 1960. Print. John Keats. Complete poems amd selected letters of John Keats: http://keats-poems.com/pdf-files/. Web. 24.10.2018. Надійшла до редакції 25 жовтня 2018 року.